You are a fearless bounty hunter known to your enemies as the Lode Runner. The greedy rulers of the evil empire have plundered the world of its gems and gold, and it's your goal to infiltrate their underground treasuries and win back every coin, trinket, and gemstone. You'll be running, climbing and digging your way through a labyrinth of subterranean dangers. You'll be blasting escape holes with your powerful laser-blaster, and fending off the mad monks of the evil empire. Your speed, strength and cocky attitude will help... but only your quick wits and cunning will get you through this mission alive! 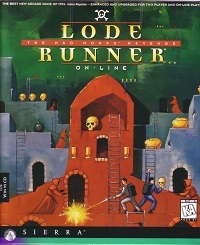 In 1993, Presage Software acquired the rights to the classic Lode Runner game by Doug Smith and created a new, updated version for modern machines, produced by Jeff Tunnell Productions. The result of this effort was Lode Runner: The Legend Returns. The game features ten worlds, each with 15 game levels that become harder as the levels progress. Each time a world is completed, a cut scene introduces the next game world which features new tools such as bombs, snares, a jackhammer, transporters and more. In addition to the single player missions, gamers can also play 30 predesigned levels head-to-head on the same computer or use the built-in level designer to create and share their own levels. 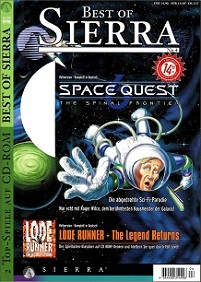 The game did phenomenally well, winning many awards, including the Games Magazine 1994 "Best New Arcade Game" award, and leading to a sequel: Lode Runner Online: The Mad Monk's Revenge. For this sequel multi-player game play over a network, modem was added. At the same time new levels and game elements were introduced, and the original 16-bit code was updated to 32-bit for Windows 95. 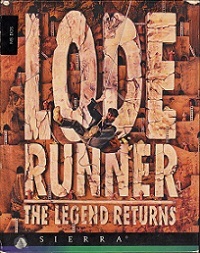 Lode Runner: The Legend returns was released both on floppies, as well as a CD-version. It was also re-released as a Sierra Original.